UPDATE: When this story first appeared on the main stream news channels, I was astounded to seem them so eager to talk about stuff that they usually ignore – as I have already mentioned (see bellow)… I should have known better! 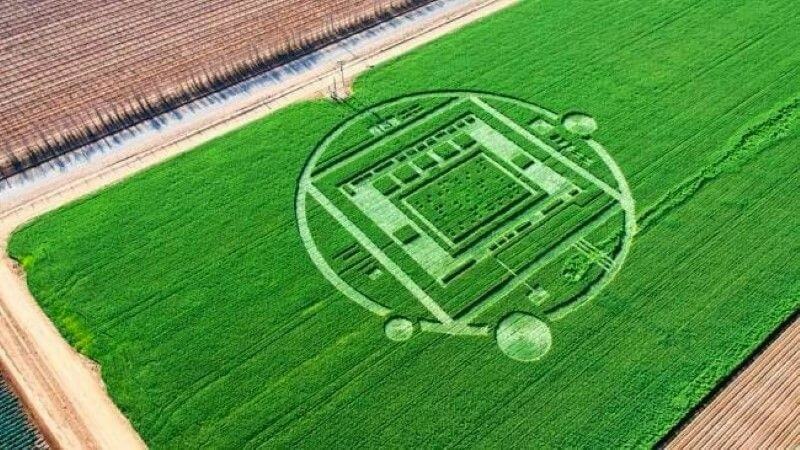 This crop circle was apparently designed by nVidia as a marketing strategy for the launch of their new Tegra K1 chip. So, it’s easy to speculate that the MSM news channels have been payed by nVidia to pick this story up and insist on it, only to later reveal that it was a hoax. It’s all about money folks, and this is one more example that the main stream media is CONTROLLED by the big corporations. It’s shameful and sad, really. The original article: It all started in the New Year’s Eve, when two friends that were driving near a crop field in Salinas, California, witnessed green flashes of light above it. Luckily, they’ve had the inspiration to record the sighting on camera, and after closely investigating it, they’ve stumbled across a one acre big crop circle. Their decision to upload the video on YouTube helped the crop circle formation gain popularity, but it’s also thanks to the main stream media channels who covered the event in detail – which is rather unusual. I have already published on HumansAreFree.com the scientific research of Dr. Eltjo Hasselhoff , in which he concluded after thorough research that “crop circles are made by balls of light.” The following is the original video showing green flashes of light over a crop field in Salinas, California. The two friends that were driving close by, when mysterious green lights started to flash over a crop field nearby. The first impressive pictures of the markings were taken by photographer Julie Belanger of the 111th Aerial Photography Squadron who flew over the site near Chualar, ten miles south of Salinas. Unfortunately, this magnificent and elaborate crop circles formation was destroyed today, even though no official agency was dispatched to investigate it. Their apparent lack of interest betrays the opposite, especially because it was destroyed before any team of – unofficial – specialists had the opportunity to carry on-site testing.